My road to gaining weight was very short and quick. I found myself in an extremely unpleasant living situation. I was living with two girls I didn’t know very well or get along with. So, I didn’t want to spend a lot of time in the apartment, much less in a common area cooking dinner each night. Instead I began cooking the quickest meals. Usually, the quicker the meal is to make the less healthy the meal is. I was also under the impression that I still had a fast teenage metabolism. I expected my body to stay the same even though I wasn’t eating well. Even throughout the unpleasant situation I was living in, I was still very active. 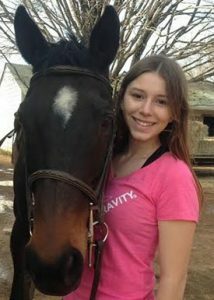 I rode my horse four or five days a week and I taught at Fighting Gravity Fitness. This shows you how unhealthy my eating habits were. I wasn’t living a sedimentary life style and I was still significantly more active than most of my friends. I didn’t realize how unhealthy I had become until I was out of that living situation. I was extremely in denial that I had actually gained almost 25 pounds in less than a year. It took me about two weeks into my new apartment to start running and to change my eating habits. When I began exercising more and eating healthier I still didn’t have an epiphany that I was overweight. I had a goal and I was determined to reach it. I started changing my lifestyle because I wanted to run a half marathon. So, I started running four or five days a week and the weight immediately started to shed off of me. I remember weighing myself and being shocked by how quickly I was losing weight. Next, I began to change what I was eating. I wanted to run longer and harder. I wanted to be able to do more with my body and for that to happen I needed to eat differently. I realized what I was eating, what was fueling my body, was only making my goal harder to reach. If you fuel your body with food that isn’t natural or healthy your body will not function as well. I gradually changed my diet. I knew that if I tried to dramatically change how I was eating the chances of the new lifestyle sticking were slim. So, the first thing I did was cut out my favorite unhealthy food, pizza. I remember going three months without eating pizza and being so proud of myself. Once I knew I could resist my cravings the next thing I eliminated from my diet was ice cream. For as long as I can remember I have had problems with sugar. When I am stressed or upset I immediately crave anything remotely sweet. I became more conscious of this and I began recognizing that I was only craving something sweet because I was upset and instead of reaching for the sugar I ran or took a class at Fighting Gravity Fitness. I conditioned my body to crave exercise as a way for me to relieve my stress rather than eating. Once I cut out these two very unhealthy food I tried to just gradually add in more vegetables and cut out processed food. I would still buy some processed foods, but for the most part I stopped buying packaged foods and tried to make everything I could from scratch. Most packaged food is filled with preservatives and sugar. Even the packages that advertise as nonfat or low fat may seem healthier, but they are loaded with sugar to ensure that they still taste good. The main thing I wanted to lessen in my diet was sugar, which is why I buy very little processed food. One thing I did that made this process a little easier was buying a spiralizer. I got one for ten dollars off of amazon. So, instead of making pasta I would zucchini noodles or carrot noodles. This took out the processed boxed pasta. At first I still used jar pasta sauce, which isn’t completely ideal, but like I said I was taking it slow. I added in more vegetables and cut out one processed food, the boxed pasta. Once I had gotten comfortable eating more vegetables I started trying new recipes and I tried to come up with more creative ways to add vegetables into my diet. I also began making almost everything from scratch. If I want to eat bread I make whole wheat bread from scratch and fill it with flax seed, sunflower seeds, and oats. I only use two table spoons of honey to sweeten it. Once I changed my diet I realized that splurging and eating fast food, pizza, or something sweet wasn’t worth it. Whenever I do eat that food I never feel better it doesn’t shrink my stress anymore, instead I notice that I am bloated, fatigued and physically feel worse. This year exercise saved me. This year was incredibly difficult. It was my final year of my undergraduate degree and I was stressed trying to balance work, school, and having a fun year. Also, just like everyone else I had to deal with all of the stress and pain that life throws at us. Instead of letting the stress overcome me I ran. I didn’t try and squeeze exercise into my day I planned my day around my workouts. There were many days I would spend my days in class, then running, then at work, then cooking dinner and I would be up very late getting my work done. But I felt so much better prioritizing my health. I easily could have skipped running finished some of my homework then gone to work and picked up dinner so I could spend my night watching television rather than doing homework and cooking. I wouldn’t have been nearly as happy if I had made those decisions. I also had more energy because I was exercising so much. So, staying up late doing homework didn’t seem as miserable. The aspect of this weight loss journey that I am most grateful for is that I didn’t go into running with the goal of losing weight. I went in to this journey with the mindset of I have a goal and I will complete it. I wanted to show myself what my body was capable of. I think this mindset helped me lose the weight in a healthy way because I wasn’t constantly weighing myself or beating myself up if I ate something unhealthy. We all have days where we don’t eat our best. That is normal and okay. So, if you are trying to lose weight I really encourage you to find something you want to complete, set a goal and stick to it. Make the fitness journey about reaching your goal rather than making fitness only about losing weight and the way you look. In my opinion, we should all view fitness as a way to show ourselves how strong and powerful our bodies are rather than punishment for what we ate. We want to celebrate our strengths rather than expending our energy punishing ourselves for very minor mistakes. Currently, I exercise on average fourteen times a week. Not because I want to lose weight, but because I mentally need to exercise to release my stress, relax, and to work through any problems I am experiencing. Even my boyfriend will ask me if I went on a run if I’m particularly stressed. He can see the differences on the days when I don’t exercise. I did not complete a half marathon last November. I started playing competitive sports when I was seven. As I am sure you can imagine I have had a few serious injuries and surgeries under my belt even at 21. I didn’t run the half marathon last year because of problems I was having with my hips and knees, but as long as my body can handle it I plan to run the Richmond Half Marathon in November. Here are a few recipes that helped me find new ways to add more vegetables into my diet. Craving pizza? Try Cauliflower crust pizza. Want a cheesy baked pasta? This spaghetti squash bake is awesome! Everyone I’ve made it for loves it! This is a great zucchini noodle recipe! I know making bread from scratch can be intimidating, but I’ve never had any trouble with this recipe. These tacos are amazing! I would highly recommend trying them! Here is a basic spiralizer if you’re interested in making veggie noodles.